Mention vitamin treatments for developmental problems and you will get plenty of raised eyebrows and non-believing looks. Well, first, if you think that ASD or ADHD are basically genetic diseases that can’t be treated, such an intervention will certainly make no sense. Second, since the traditional medical community has spent so little energy or resources understanding nutritional intervention for anyone, especially children, a paucity of information on this topic for neurologically affected children will certainly follow. There are other websites which explain how to evaluate the ‘correct’ intake of each vitamin, especially conceding the differences between RDA, RDI, and DRI. Suffice it to say that, at present, labels display nutritional information which informs a consumer how much of some nutrient is in a particular product compared to how much of said nutrient it takes to stay well, based on a 2000 calorie diet. Of course, that assumes a healthy adult individual, so the values don’t really pertain to most of my practice, or your children. I have personally cared for many children from all around the world who have lived in absolutely the most abject circumstances. Places where austere would be considered a luxury. Even in the most impoverished conditions, or in the most hopeless children’s home, it takes a great deal of deprivation to create changes affecting the central nervous system. It’s called brain-sparing, which refers to the body’s resilience and ability to feed the brain, at the very least. Such youngsters develop symptoms, to be sure, called “Failure To Thrive”. Nutritional intervention and therapies have specific effects on these patients. However, their maladies are NOT the modern manifestations of ASD and ADHD that have affected 1/5 of today’s children. Here’s what I want parents to understand: Eleven (yeah, right, 11!) Nacho Cheesier Flavored Tortilla Chips provide half-a-meal’s worth of calories, a meal’s worth of fat, and contain over 25 ingredients. MSG is listed in the top half. The ‘food’ contains artificial colors “including red 30, blue 1, yellow 5” plus “natural and artificial flavors…” What does that mean? Well, for one, it means more glutamate (non-sodium monosodium glutamate), since the food industry is allowed to label it that way. This nonessential amino acid (and ingredients like it) definitely affect the central nervous system and could play a key role in modern developmental problems. Recently, a mother asked me to check on some ‘organic’ crackers that contained products consistent with her child’s allowable diet. There were also 5 ingredients listed which were “added to improve freshness”. Organic? Really? I observed another (ADHD) patient go absolutely bonkers in my office last week. The Mom, who is an intelligent, observant and involved parent, perceived that the problem was that his stimulant medication dose was wearing off. We then had a conversation about what the child ate for breakfast, and it became clear to her that – perhaps – the food may have had just as much to do with his behavioral changes as the medication. Or, at least, by optimizing his nutritional intake (and minimizing the poisons) there wouldn’t be a need to alter the stimulant drug. We don’t think that the food that we give our children is affecting their behaviors. What the tobacco industry did to poison the population of the 20th century, the mega-conglomerates that feed us are doing now. Tactics such as having professionals tell us that a product is safe or others who use statistics to blind us from the problem, as in “What epidemic?”. “Vitamins, Shmitavins” you say? Optimizing nutrients for all children will result in their best growth and development. Ideally, it should be tailored to provide the correct amount of nutrients for each kind of metabolism. We still need a lot of research to answer all of the questions. In the meantime, children who are diet restricted – for whatever reason – ought to have their intake evaluated in order to optimize the nutrition that they should be getting based on today’s information, considering their particular G-I health. That is where a DAN! doctor can assist the family in choosing the best supplements which pertain to their particular child. One size does not fit all, especially when high doses might cause harm or a child’s underlying condition may demand a special intervention. Please read the labels – not just for “nutritional information” but ingredients, as well. If it contains the word “artificial”, it’s not food. Let’s get cracking on the basic problem and I will continue to discuss nutritional particulars in later blogs. This entry was posted on Sunday, September 11th, 2011 at 11:26 am	and is filed under >ALL<, AD/HD, Alternative and Complementary Medicine for ASD, Diets, Patient experiences. You can follow any responses to this entry through the RSS 2.0 feed. You can leave a response, or trackback from your own site. Do you have a recommendation for vitamins for ASD children who refuse to take OTC vitamins? My 11 year old ASD son is a very picky eater (poor diet) with alot of sensory issues. He tried gummy and chewables and hates them. He won’t take liquid because he can see it and honestly it tastes gross 🙂 He can swallow his meds, but the pills are small, and daily vitamins and supplements are horse pills. Not gonna happen either. We live in Plantation and have access to many specialty stores and online of course. Any suggestions? First of all, you want to assess exactly WHICH vitamins are important. That way, you could minimize the number of supplements. Then, various alternatives could present themselves, such as creams or smoothies, for example. It makes a lot of sense that modern nutritional information is based on the diet of a healthy adult and doesn’t really account for children or other age groups. 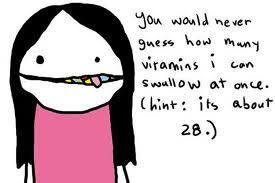 Having the ability to know the vitamins needed for autism, for example, seems like a handy thing to know. Or even simply knowing how much of something that a baby should have would be helpful. Mono Sodium Glutamate, a naturally occurring non-essential amino acid used to enhance flavor.